This year is slowly coming to an end, so the time is right to take a pause and recognize the top trends of the year. Whether fashion is your passion and part of identity or just an occasional hobby, you can be benefitted by some pondering. By defining the newest trends, we mark the time we live in and can even get an idea of what’s going to be popular during the next season, by looking at what we have now. These easy t-shirt trends may seem mundane at first, but if you’re interested in fashion and are up to date, these observations may come in as handy. One of the most popular statements this year were sporty t-shirts, worn at various occasions. You could spot them anywhere, and people more than often opted for them when going out to different social gatherings, cafes, shopping malls etc. 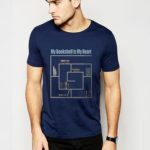 One of the most important things to point out is that people got used to this style fairly easily, because sporty t-shirts are considered to be normal casual wear. This is not completely new in terms of trends, but it is slightly more popular than the last year. Printed shirts give the diversity any fashion statement needs: it can stand for retro bands, series and pop culture in general, as well as line art, technology and modern design. The market is full of them, but the best thing is that you can choose t shirt printing services and by doing so, flaunt your own style. The possibilities are endless! Number three on our list are statement shirts, because they are becoming more and more popular with time. Whether it’s a quote of your favorite writer or a celebrity, it is both a fashion statement and a statement for itself. Sending a message is all what it’s about. You can even print your favorite statement! These kinds of shirts are increasingly popular among celebrities. Bear in mind that even though it’s fun to follow different trends, you shouldn’t stop being creative and finding your own trend. If you can’t fit in, try thinking outside the box and creating a new style. It’s all about individuality and expressing yourself.